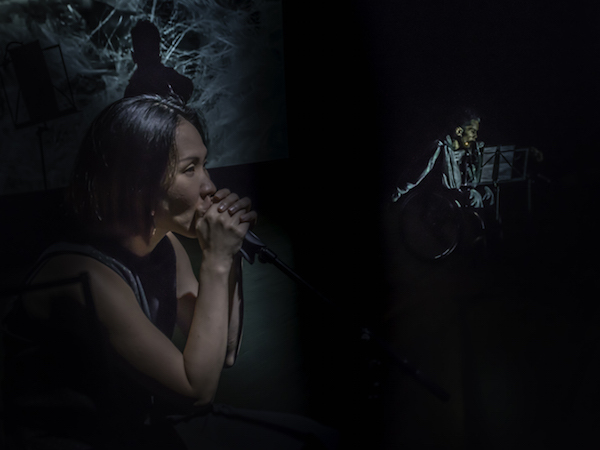 On 25 May, I had the pleasure of experiencing a performance of great chemistry between Deaf and disabled artists at the National Museum of Singapore’s Gallery Theatre. And Suddenly I Disappear: The Singapore ‘d’ Monologues premiered that night and became the first multilingual, intercultural, bi-national (Singapore and the UK) disabled-led theatre project. Inspired by the stories of persons with disabilities, this theatre performance presented fictionalised monologues performed by disabled and Deaf artists, providing access and bridging two opposite countries of the world. It was an intercultural performance, careful in representation, and presented in various languages (spoken, signed) enhanced with artistic multimedia in parts. The team, led by playwright, Kaite O’Reilly, and international director Philip Zarilli, together with principal collaborator, Peter Sau, featured prominent UK disabled and Deaf artists such as Sara Beer, Sophie Stone and Ramesh Meyyappan in collaboration with experienced and aspiring local artists such as Daniel Bawthan, Grace Khoo, Lim Lee Lee, Stephanie Fam and Agnes Lim. 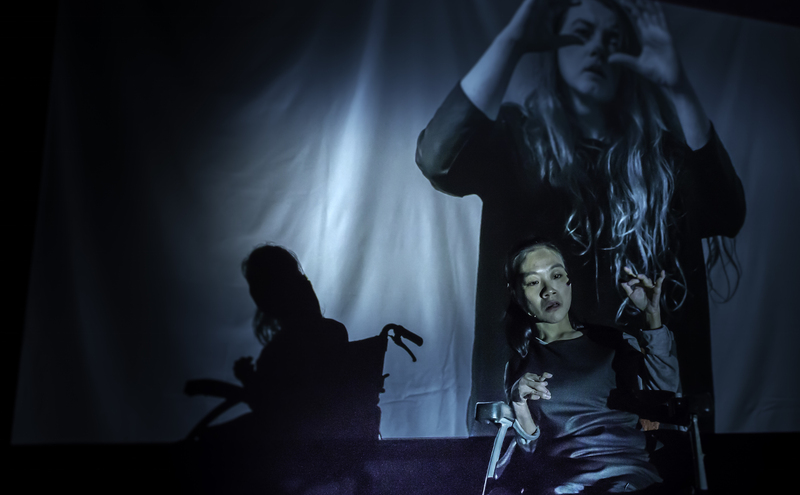 In writing a reflective piece on this novel theatre presentation, one shouldn’t underestimate the exercise of checking one’s abled privilege – that in itself is definitely not an easy task. I engage in the processes of “Disability Mainstreaming” to ensure that I do not misrepresent the different talents and their experiences. At the same time, in writing this, I do not claim to be speaking on every aspect of the performance, just moments that have helped me reflect on my own privilege as an able-bodied person and artist. I highlight an excerpt of the lyrics expressed by Danial Bawthan (written by Kaite O’Reilly) at the beginning of this article because it is a stark reminder of what I have taken for granted. As a dancer particularly, the body is treated as a given, but not an agent of empowerment. Every time Danial utters those words with conviction, strong and loud, I not only hear him, but I feel him, as if our bodies were in dialogue. There were many beautiful moments in this performance, by turns witty and heart-wrenching, but what was important was the platform to express, and for voices to be heard and gesticulated out loud. “A body like mine doesn’t feature in love scenes … Juliet to someone’s Romeo. The exchange between veteran artist, Sara Beer, and Peter Sau playing the role of an arrogant actor tasked to learn how to portray a disabled person, was quite impactful in its provocation on representation in the media, of actors/actresses portraying persons with disabilities. The aforementioned statement by Beer was enough for me to reflect about acts of dehumanising the Other. Beer – who creatively described herself earlier in the performance as someone who has a “raised left shoulder, slightly lopsided, lolling in a doorway that isn’t there” – was witty yet sharp in her delivery. 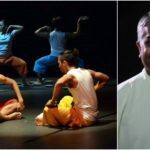 One scene in the performance which featured Ramesh Meyyappan, a Deaf performer, compelled me to consider how unfortunate it was that my senses (and my sensibility) have normalised certain modes of performance that I was unable to withstand the “stillness” and aural vacuum of the moment. I tried rebelliously to fight the lethargy that overcame my senses, as a result losing the opportunity to acknowledge and experience the realities of a Deaf person. It made me reflect rather urgently what it must be for someone who is Deaf to be devoid of our own aural and sonic realities. Later I would watch the recorded performance of that scene with Meyyappan on Youtube. It was a beautiful moment watching Meyyappan portraying a Deaf person finding his/her “voice” through signs and gestures, while experiencing discrimination, which conveyed how society demands one to conform to certain ideals and behaviour – so much so depriving a Deaf person his/her own means of expression. I was very drawn to the production as a whole particularly because poetry became a medium of empowerment, reminding us that in the abstract of words, we find a space for ourselves, and demand our presence to be felt. Many times, I felt that the strength and earnestness of these performers, their undeterred will, reminded me how the able-bodied have subjugated our bodily experience, conditioned by society’s expectations to conform to certain ideals. During the post-show discussion, I felt inspired and motivated, feeling that an inclusive community is possible. I saw empowered disabled and Deaf artists who expressed articulately their thoughts and hopes. I pray this will become a reality in due time. We need to work on the flawed “charity model” that continues to subjugate and perpetuate stereotypes of persons with disabilities. I am hopeful that more can be done through exposure in the arts and education, so that we may all continue to reflect and use privilege for good. Article edited on 19 June 2018 to include corrections to certain inaccuracies that was highlighted by Kaite O’Reilly in her comments below. 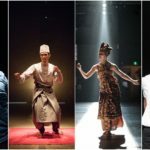 And Suddenly I Disappear – The Singapore ‘d’ Monologues by Access Path Productions, which premiered at the National Museum Singapore Gallery Theatre, running from 25 to 27 May 2018. 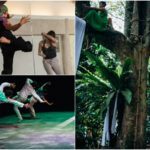 Guest Contributor Soultari Amin Farid is a choreographer, arts educator and researcher from Singapore. He is currently based in London where he is a PhD candidate in Theatre, Drama and Dance studies at Royal Holloway, University of London, UK. Thank you so much for this fresh perspective on my project. I’m going to reflect and absorb over the coming days – but as an immediate response: I am grateful for your engagement, and thank you wholeheartedly for this opportunity to share, reflect, and dialogue. Just to clarify, all of the cast identify culturally and politically as Deaf or disabled, so we were a disabled and Deaf-led company, not an inclusive one of non-disabled and disabled performers. Also, the lyrics to the rap Danial presented with such passion and verve were written by me for him, not written by Danial himself, although he is also a fine wordsmith and always worth checking-out. I am happy that you feel an inclusive future is possible, and that you celebrate, as I do, the empowerment of disabled and Deaf people. In order to move forward into a more inclusive and diverse future, I feel we need to deconstruct and dismantle the Charity Model of disability and not ‘work on’ what you identify (correctly, I feel!) as a flawed vehicle. Adapting it will not change the central inequality and ableist hierarchy at the heart of the Charity model. I feel rather we need to move forward into other considerations, like the social model, that sees us all as equal, and that it is the physical and attitudinal barriers in our societies which disable, not the body itself. I’ve loved working in Singapore with my wonderful collaborators, but also because I have encountered a deep desire for change in each Singaporean with whom I have had a conversation about inclusivity, disability, and the problems of the charity model. Your article encourages me and opens up conversations – and long may this continue! Thank you! I am humbled by your immediate response to my little response. My apologies and thank you for the clarifications. I feel quite attached to the work becauseI have worked quite closely with Grace Khoo before in a work that explored global identities and minority representations in 2016 at the Edinburgh Fringe Festival. She has shared with me many of her novel ideas of inclusive and democratic theatre and its due to her I’ve become more inclusive in my thoughts and ideas. At the same time, I too realise I have much to learn and change as well. I was very touched by the representation and have decided not to do a review but offer a personal reflection on what I felt. The arts scene in Singapore is still grappling with issues of minority representation (ethnic, abled-disabled, sexuality) and as a choreographer I believe we privilege abled bodies or at least have yet to to explore the possibilities of working with disabled, Deaf artists. The work was inspiring and it was actually an IG post and I was approached to provide a more nuanced and extended version for Arts Equator. I am so grateful today that it has paid off because You have responded to it. I am touched and it has made my Sunday, 3rd day of Eid more meaningful here. I will be back in London early next year for the writing-up process of my PhD at Royal Holloway, Uni of London. 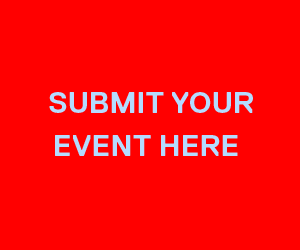 I pray we get to meet in due time and for me to come for your future shows to appreciate, dialogue and support!